Staff at the Tasmanian Museum and Art Gallery (TMAG) have today announced their own favourite work from the 2015 City of Hobart Art Prize. This year the City of Hobart, in association with TMAG, introduced the TMAG Gallery Staff Art Prize, a new prize category for all shortlisted entries in this year's prize. Since the exhibition opened in September, TMAG Visitor Services Officers (VSOs) have been overseeing the galleries and have voted on their favourite work across the combined mediums of ceramics and drawing. They have selected Jealousy, by Tasmanian artist Marion Abraham, as the winner of the inaugural, non-acquisitive TMAG Gallery Staff Art Prize. 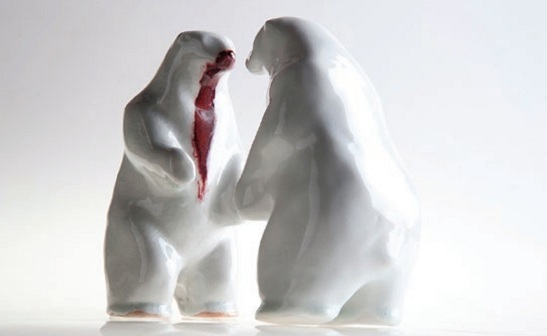 A ceramic depiction of two polar bears, the VSOs describe Jealousy as "a unique piece, made simplistically with natural charm and good humoured character". They said the choice was very clear from early on amongst the majority of the team, as the work engendered a heartfelt response, it was accessible, and had social and environmental context. As part of the prize, Marion will receive a $250 Pennicott Wilderness Journeys Cruise, as well as a $250 voucher from Artery Art Supplies in Hobart. TMAG thanks both of these sponsors for supporting the inaugural prize. Members of the public still have time to vote for their favourite work, with entries in the People's Choice Award still open. The winning artist of the People's Choice Award will receive $1,000, and those who vote also go in the draw to win a $100 gift voucher. The City of Hobart Art Prize 2015 exhibition is on show in TMAG's Argyle Galleries until Sunday 29 November 2015. Find out more about the prize and download the exhibition catalogue at the City of Hobart website. Image details: Marion Abraham, Jealousy (2015), slip-cast porcelain, reduction-fired glaze, 20 x 30 x 20.